In the years since the felling of the World Trade Center towers, the Brooklyn Bridge has taken on an increasing symbolic importance to New Yorkers. The bridge is now used as a backdrop for almost every local television news broadcast while the adjacent state and city parks along the East River in DUMBO, Brooklyn are regularly used as settings for fashion and other advertising photography and for television shows of various stripes. The relationship between developers, preservationists and those favoring the construction of a new middle school, is a contentious one that likely won’t be resolved any time soon. Even if the proposed development gains the necessary approvals, it is not clear when, or if, the project will ever be completed. 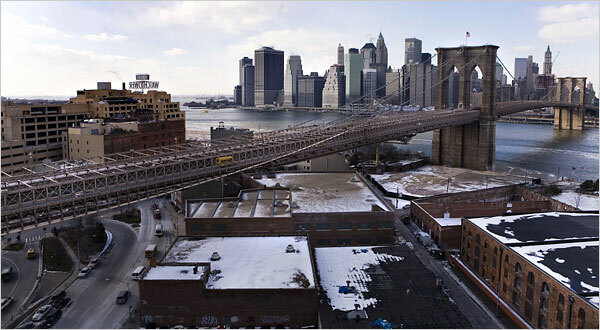 One need look no further than the oft-delayed and scaled-back plans for the Atlantic Yards development in downtown Brooklyn to know that the battle to preserve the sanctity of the Brooklyn Bridge will be a long one.